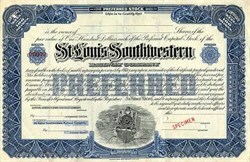 Beautifully engraved Specimen certificate from the St. Louis Southwestern Railroad Company. 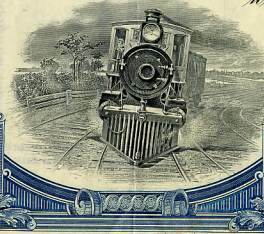 This historic document was printed by American Bank Note Company and has an ornate border around it with a vignette of steam engine moving down the track. The St. Louis Southwestern Railway Company, was known as the "Cotton Belt Route," and was organized January 15, 1891. It origin, in 1876, was in a company organized to construct a railroad from New Madrid, Missouri to Helena, Arkansas, which company consolidated with the Texas & St. Louis. In 1885 the property passed into the hands of Colonel S.W. Fordyce as receiver, but the next year was sold to J. W. Paramore, and others, styled the Bondholders' Commitee, the road now being known as the St. Louis Arkansas & Texas Railway. August 4, 1887 the Arkansas & Southern Railway Company bought the property in Arkansas, and about the same time the property of the Little Rock & Eastern Railway Company, and the consolidated company was formed under the name of the St. Louis, Arkansas & Texas Railway in Arkansas and Missouri, which purchased the property of a company organized to build a road from Malden, Arkansas to Delta, Missouri, opposite Grand Tower, a distance from Malden of fifty one miles. The St. Louis Southwestern proper, operated 582 miles of main track; the St. Louis Southwestern of Texas, 551 miles; Tyler Southeastern, 88 miles - total, 1,223 miles.